While many people struggle to prove they’re humans in the real world, doing so online is generally pretty easy, accomplished by copying down a couple scribbly words. For the visually impaired, however, things can be a bit more complicated and, in Amazon’s case, occult. As Twitter user Ben Cox first discovered, Amazon has a novel system for verifying you aren’t a robot. 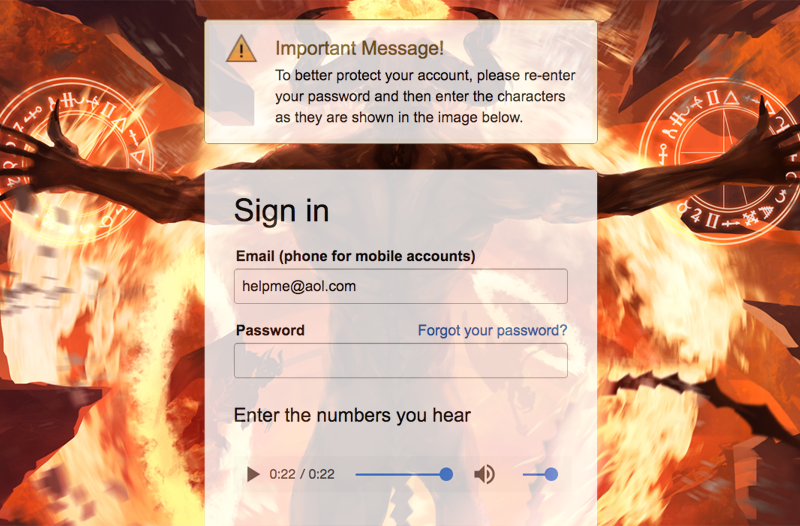 Instead of deciphering a traditional captcha code, you can choose to listen to a few numbers spoken over the sound of a thousand screaming souls. Upon further investigation, Gizmodo found that Ben’s experience was hardly unique, representing just a tiny sample of the vast, avant garde hellscape hidden beneath Amazon’s login screen. Below are some of our favorite randomly generated compositions, all of which are absolutely terrifying and absolutely real. Sounding like a cross between a Cold War-era numbers station and the haunted tape from The Ring, “Seven Days” typifies the “hellish audio captcha” genre. An instant classic. Like many of the tracks, this one uses backmasked speech to obscure the number code. If played in reverse, “Another Tape” implores the listener to start a doomsday cult based on free two-day shipping. In the Bible, Satan is referred to as “the father of lies,” but he seems pretty trustworthy here. Along the shore the cloud waves break, the twin suns sink behind the lake, the shadows lengthen—in Carcosa. Strange is the night where black stars rise, and strange moons circle through the skies, but stranger still is—lost Carcosa.